Hello friends, it is so nice to have you all here in the “Deck the Hall Christmas Tour” hosted by Decor Gold Designs and Randi Garrett Design! I bet you couldn’t get enough of Kathleen’s (Lindsay Hill Interiors) amazing living room. She’s one of my favorites interior bloggers because her styles always feels so welcoming and relaxed while using neutrals and some pop of colors. Today I’m going to be showing you how I’ve “decked my living room halls for Christmas”, and just like Kathleen, you’ll notice I’m also a fan of neutral colors. Our 1938 house in Miami is not big. When we first moved in, almost three years ago, the realtor was telling us how the houses in these areas were use solely for vacation purposes. Hence the lack of room and closet space. Our living room has the original fireplace and I always love to decorate this area thinking on ways to emphasize its beauty and detail. Because I don’t want to take away from it, I’ll usually style this area with a minimal approach. This Christmas I chose a natural Magolia garland from The Magnolia Company to hang over the mantle. The color of its leaves was all this area needed . To draw even more attention to our fireplace, I hanged the London mirror (from Grandin Road) over the mantle in this wall. Also by adding a set of metal reindeer (Grandin Road as well) I was able to add visual height. A pair of “INK + IVY Waldorf Alligator Faux Leather Lounge Accent Chair” from Lamps Plus served as the perfect frame for the fireplace. These sculptural seats elevate the entire look of our living room by providing a modern accent and creating an interesting contrast of styles against the fireplace. The faux leather of the seats felt incredibly comfortable. My husband and I love sitting here and talk about the day’s events. Now let’s talk about this amazing “Mandovi Cowhide AL03 Rug” from Rugs USA. I can’t get over its detailed geometric pattern and I love the fact that the subtle gray color doesn’t clash with either the wood floor or any of the other elements in this area. 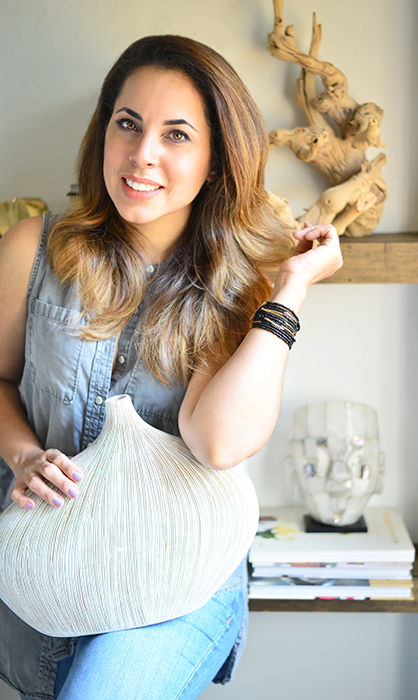 As you’ve already noticed, I love mixing my neutrals with metallics, specially gold. So throughout the decor and including the ornaments in the Christmas tree you’ll find sparkling accessories. One example is our “PB Teen Maison Bookcase“. Besides being the perfect spot to display all my Christmas houses, the soft gold tone blends very well with the rest of the furniture. Over in the foyer table I also have more metallic pieces which I mixed with wood accessories to balance out their shiny surfaces. To warm up the rest of the decor, I added a couple of toss pillows in faux fur and leather materials over our sofa. The “Luxury Faux Fur Pillow in Snow Leopard” from Frontgate feels so soft and is the perfect match for the “Mandovi Cowhide AL03 Rug“. I created a subtle contrast by adding a pair of faux leather pillows from HomeGoods and the Cube Natural Hide pillow from Grandin Road that served as the unifying element in this setting. I believe that the key in making this room feel welcoming and comfy lies in creating a balance between the materials and surfaces used. I love coming into this area and just sit and relax while watching our Christmas tree all lit up at nights. Now, I don’t want to hold you here so why don’t we all go and visit my lovely neighbor Janet in her blog Shabyfufu. I know you’ll fall in love with her elegant and romantic approach in decor. Have a Merry Christmas! This post was sponsored by some of the brands named here. All the opinions included are mine. gloribell, i LOVE your mantle! it's gorgeous! the entire space is beautiful! Gloribell, you nailed it again! I adore your clean, eclectic look. So pulled together and so pretty without being overwhelming. That leather rug is gorgeous, and I'm a huge fan of your chairs. Everything is beautiful! So glad we've connected in this design community, because you continually inspire me! Girlfriend I am so blown away! I love everything about this from the leather chairs to your fireplace to your color pallete for your Christmas decor. Especially love the mantle!!! And ok I have to mention that your nighttime photography shots are stunning and now you are making me want to photograph my house at night too!